Beauty as messenger. I’ve taught literature for many years now. I remain convinced that great literature reflects man’s best, noblest, most exalted efforts to express truth beautifully. For some, that may sound sentimental and saccharine. For others, however, Browning’s line, “Ah, but a man’s reach should exceed his grasp, Or what’s a heaven for?” expresses what great literature aims for, namely, truth beautifully written. Might truth beautifully expressed be a messenger? And why do most avoid contemplating it? The things in life that mean most to us are oftentimes the things about which most people avoid talking. It is more convenient to tweet or post. Headlines, not history. News is just that—new. We’re a “… and now this” culture, as Neil Postman wrote about. It’s what’s “happening now.” There is no room for the great enduring truths of literature when we can get updates sent to our phones and have news scrolled across the gadgets of our choice. We’re connected electronically but exiled in our souls. Where’s room for truth and beauty? Any room for a messenger? The world is too much with us; late and soon,/Getting and spending, we lay waste our powers;–/Little we see in Nature that is ours;/We have given our hearts away, a sordid boon!” Wordsworth’s poem, “The World Is Too Much With Us,” still speaks, does it not? Might these words, penned hundreds of years ago, serve as a messenger of that which endures? This morning driving to work I had the radio on in my truck. The radio DJ was telling of how Tom Petty died this week, and of how his albums are now selling at many times the rate they were when he was still living. I was not a big fan of Petty’s music but I do respect how he labored in his craft. For Petty, it was music. His songs are played constantly because he spoke to the human experience and he tailored his talents to fit the genre of rock and roll. And music lovers continue to respond by buying up his albums and turning up the volume. There’s a message through all this and it’s not just the tunes. It speaks to a longing in the human heart for beauty and for truth. I do not wish to stretch the analogy too far. I would not choose to argue that Petty’s lyrics are great literature. However, Petty’s music has endured because it speaks to people in ways music mysteriously has the power to do. It touches people’s souls. It stirs them. It reminds them of what they value, of what brings joy. And those things endure. I’ve read the following lines hundreds of times: “The heart of man plans his way, but the LORD establishes his steps” (Proverbs 16:9). It’s a reminder that we don’t know our end. I doubt that Tom Petty knew last week that he had less than a week to live. James wrote in similar fashion: “Come now, you who say, ‘Today or tomorrow we will go into such and such a town and spend a year there and trade and make a profit’—yet you do not know what tomorrow will bring. What is your life? For you are a mist that appears for a little time and then vanishes” (James 4:13-14). Why do I still love teaching Shakespeare and Faulkner? Why do I try to open the Psalms to students who malnourish themselves on intellectual Twinkies? It’s because I remain more convinced than ever that the human soul atrophies if starved of truth and beauty. I plan to drive home late today. When I do, I will drive north and the sun will be descending over the trees over my left shoulder. When I enter the community where my family and I live, I will wind over hills and cross a lake. On that lake, the sun will place its golden fingers across the water’s surface. Loons and geese will likely be flying overhead. Drakes and ducks are likely to be paddling around and dipping their heads beneath the surface, then reemerging with drops of water on their glossy crowns. And again I will be speechless before beauty. I will be suddenly filled with a message. It’s a message worth telling. 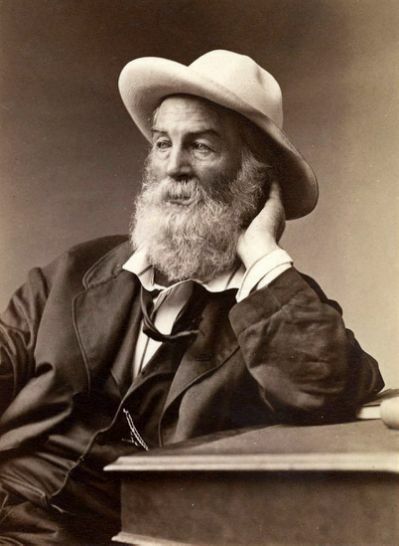 I remember the first time I read Walt Whitman’s “When I Heard the Learn’d Astronomer” in college. The poem plucked some invisible strings within my soul. I discovered that the right words in the right order changed things. They gave utterance to stones we carried in our hearts. Solomon sounded similar thoughts in Proverbs, predating Whitman by millennia when he wrote, “A word fitly spoken is like apples of gold in a setting of silver” (Pr 25:11a, ESV). As the teacher read aloud most students seemed as moved as molasses. But I looked at the teacher and saw the flame in his eyes, too, that drew light from Whiman’s light. This poem named the unnameable; it expressed how mystery unfurls into a soul. Mystery found relief in language. Decades later I still go back to that poem, and picture the speaker in the poem trying to listen to pablum. He tried to act the part of dutiful acolyte. Perhaps he envied those who were satisfied with the trivial. But instead, he heard chords sound from outside him, and yet to him, as from the divine conductor. And then he discovered himself looking up at the firmament, almost daring to speak. To that which I was too busy to see. And creatures may behold heaven’s art upon every bough. I’d have thrown more and stayed longer. Certain poems I find I cannot shake. Richard Wilbur’s poem, “The Beautiful Changes,” is such a poem. It continues to grip me. Perhaps it is because this past week, I visited the eye doctor and I received some news. I don’t need just reading glasses; I don’t need just driving glasses; I don’t need just work glasses. I need glasses—period. My eyes are fading. My years of being an avid reader have caught up with me. My eyes are fading. Yet in some ways, I think I see better. I’ve grown older and my eyes have lost some of their original power. Yet with the years, I understand that time brings some things into focus. “The Beautiful Changes,” is a three-stanza poem dealing with how beauty endures in spite of time’s effects. The reason people continually pursue beautiful things and moments is because we see how time robs and destroys much of life. The dominant image is of a person walking through a meadow of Queen Anne’s lace. As the character walks through the meadow, the Queen Anne’s lace divides, almost like rippling water. The character sees how his motion causes other motion. He sees a sea of movement. Time is captured in the image of motion. The second stanza is perhaps the most overt in its expression of the poem’s meaning of how beauty is a bulwark, not just in spite of time, but in a way, because of time. Wilbur writes that a mantis’ presence is “arranged/On a green leaf, [and] grows/Into it, [and] makes the leaf leafier, and proves/Any greenness is deeper than anyone knows.” The idea is that people would not notice the beauty unless time ravaged us. We appreciate beautiful sights when we “see” that we don’t see as well as we used to. The dimness of physical limitations becomes a conduit to seeing the beauty that is there if we could see it. We experience the “second finding” (line 17) more wonderfully for knowing that beauty, not our experience of it, lasts.